I KADA Dance Company is proud to present the third annual festival, KoDaFe (Korean Dance Festival). 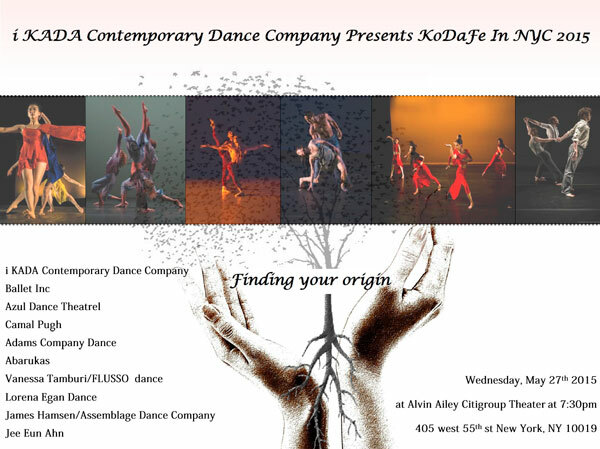 The I KADA contemporary dance company was formed in September 2011 in New York City. The company name “KADA” stands for “Korean American Dance Association” and the I KADA Company focuses on cultural exchange between American and Korean dancers. The KoDaFe is a vital part of this cultural exchange program. This festival aims to connect dancers and to build strong relationships between international dance companies. The theme of this year's festival is "Finding your origin". Finding your origin...Can mean many different things to different people. Three simple words that can stir up so much feeling and emotion within us all..
Time, history, family, culture, connection, to who we are and where we come from are just a few things that my come up. A combination and accumulation of all that was.. resulting in, what is now.. You, me and the world we live in at this present moment in space and time.. The search can always start by looking within ourselves.. All the answers to the questions we have are inside us. Understand and realize that everything in this world is all connected.. And that karma helps keep a steady balance to the fragile thread of our existence.. So in essence all of our origins are the same.. So a vivid visual would be a redwood tree in forest representing our origin.. Massive in size and towering like a skyscraper.. And the many branches spreading out from the tree to blossom and bloom as the leaves change colors at different times during the different seasons representing us.. Showing we are all the same but very different. KoDaFe in NYC, 2015 Promo video! For more information, please visit http://www.ikadadance.com.